Wed……June 29, 2011……Hello everyone, we have been changing internet service providers and have had some significant interruption to our service as well to our phone lines. Our new equipment should be completely installed by Friday and up and running as far as online service, email, etc. Phone service will be complete by late Monday. They are installing lines and are having to bury fiber cable 275ft to get to our location. If you have sent an email, left a message, called we appreciate your patience and I will get caught up in responding as quickly as I can. A few updates, last nights storms were a doozy, reports of up to six inches of rain across the area including the mountains. 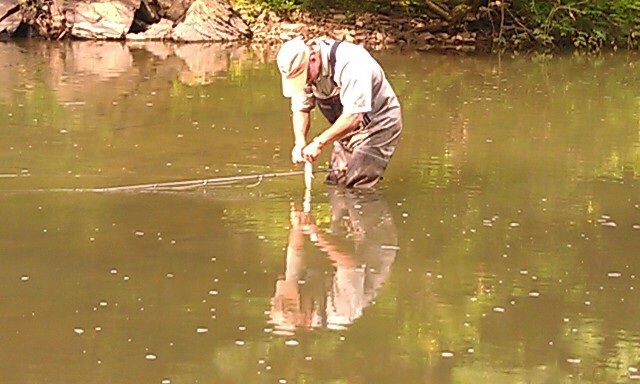 On the positive side, we have plenty of water and most smaller waters have cleared up nicely and are fishable again. 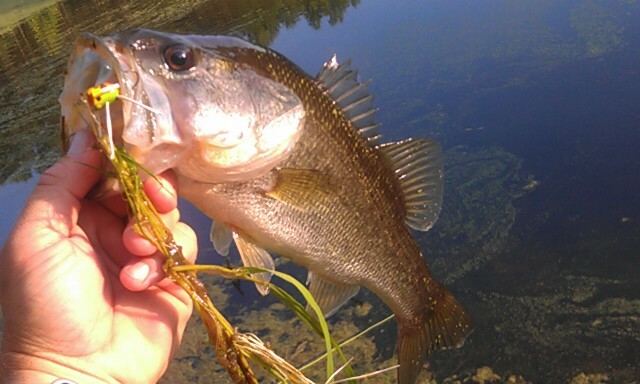 May be a few days for the smallmouth, as those waters take the brunt of a hit and are usually the last to clear up. On the South Holston dam maintenance has continued including a complete cleaning of the weir dam. The TVA is sluicing 350cfs and will continue this for some time. Our trips will resume on Friday on the Holston where I will be guiding Steve Krasicky from Greensboro. Another update of note is the Virginia license issue. Despite all the calls, emails, and communication contrary to an increase, the VA folks balked us and a new license increase will go into effect on July 1, 2011. You can check out the details at this link: http://1.USA.gov/mPJMB7 . So what does it mean for us as non-residents? 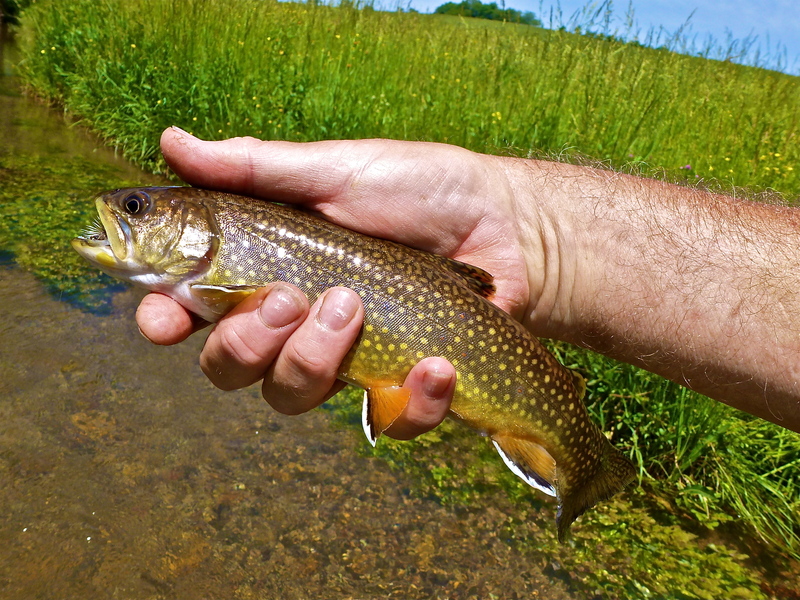 It means that for a Non Resident license, trout stamp, and Natl Forest Stamp, which are what most folks buy for fishing a variety of waters in VA, the total cost last year of $76.00 has been increased to $100.00……an increase of 25%…..!!!! 5 day licenses which were $16 will now be $21. Incredible. If you like this then celebrate, its big govt getting bigger. If you don’t like it contact DGIF at dgifweb@DGIF.Virginia.gov , or call 804-367-1000. A Montana Version of the South Holston…..
Fri…….24,2011…….Terrible up and down weather yesterday and really tough fishing……today was a different story. I went on a gut feeling that the spot we were headed to we would see a hatch. No bugs yesterday, a ton today , and we had sunny warm weather which made a difference. We caught some nice fish , probably 40 in all, and all but one on dries. A good mix of browns and rainbows and some dandy ones. 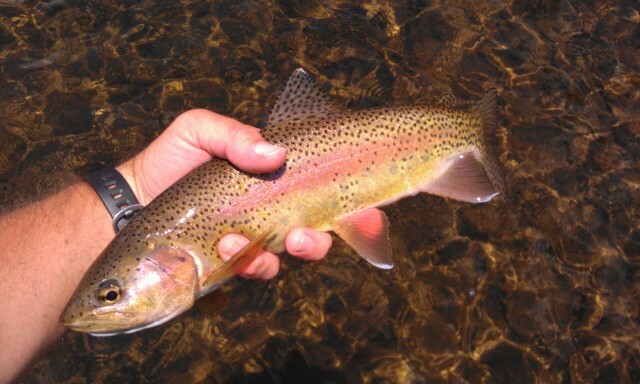 We had about 4 hours of some of the best dry fly fishing we could have asked for. The bugs were a mix of 16 and 18 sulphurs…….but tons of 18s. Just got off the water before dark and going to enjoy some dinner. Have a great weekend…….. Started out on the SoHo and by 130pm we still had not seen any bugs. I was guiding Dr Jim Kramer and we decided to bag it and head over to the North Holston in VA. We caught probably a half dozen smallmouth and largemouth bass and probably a dozen to fifteen redbreast and redeyes. Not bad, but no biggies. 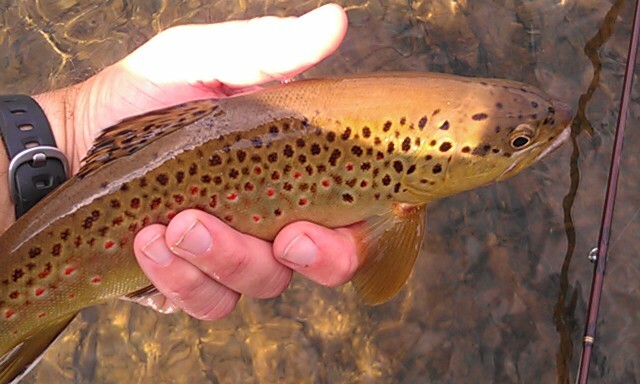 The hatch was late on the Holston, that is not uncommon when we get a cooler , cloudy day there. Today was much later …….confirmed by two folks I know….one a guide and one a customer from our area. We will head to dinner and have a crack at it tomorrow. Have a great evening….! Thursday…….June 23, 2011…….Good morning all, hope it has been a good week I am headed out again today for a two day trip guiding Dr. Jim Kramer. We will be fishing the South Fork today and the sulphur hatch. Tomorrow we will be on the North Holston fishing for smallmouth. Looking forward to a great day, more to come once we are on the water. Wed……June 22,2011…….After the morning yesterday, it would be hard to imagine our fishing getting any better….but it did just that. Our change in destination must have been meant to be….we not only got in on a good midge hatch early on , but the sulphurs turned on about 1pm and came in three ‘waves’ and there were times the hatch was as heavy as you will ever see it. Fish gulping and rising everywhere. With the three flurries we got #16 s (invarias, yellow/orange), and a #16-18 mix (some invarias, some dorotheas -smaller and pale orange), then a mega hatch of dorotheas later about two hours before dark. So better have some small flies in the box too, and we did. It was magical. 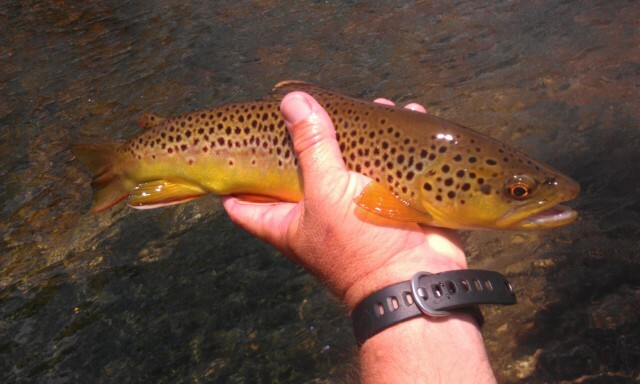 The dry fly fishing today was a good as it gets, the Bighorn, the Missouri, Silver Creek in Idaho, and the Henry’s Fork ….they all had nothing on the Soho today. It was as good as any of those places. Simply put, it was abolutely phenomenal. The bugs were still hatching when we quit at 8:00pm. We got well over 100 fish total and now when I say June and July can be as good as May on the SoHo maybe folks will believe it….I believe it….Mike now believes it too!!!! 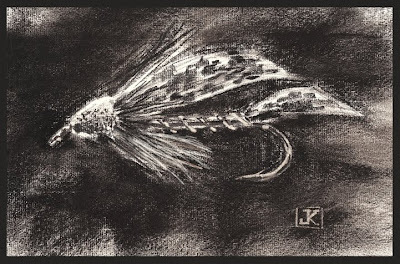 Believe it, now is some great dry fly fishing while the TVA is running a constant 280cfs release /sluice….the fish are loving it, bugs are loving it, …..I am loving it!!!!! 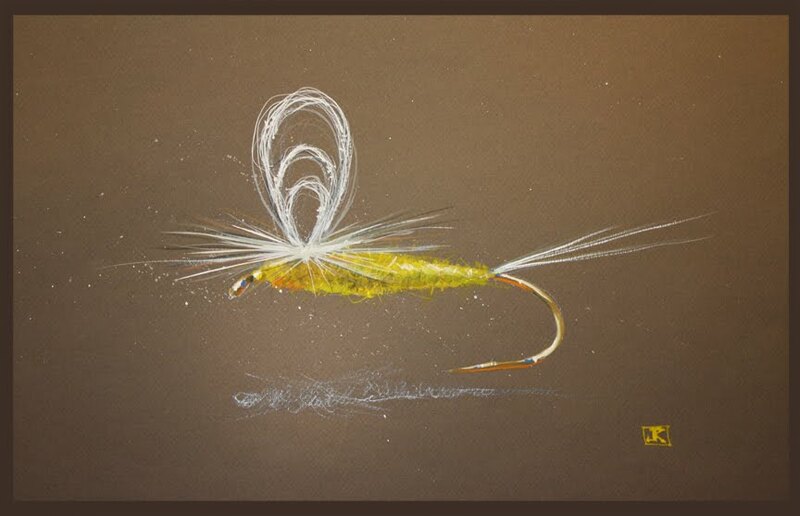 If anyone wants to take part in it and experience some great dry fly action now is the time….and I have a fair number of openings in July coming up as well. Let’s Go Fishing! We used a variety of flies but like most of the time with PMD and sulphur hatches you will do best with emerger patterns…..and so it was today. The fish usually ignore the duns, particularly with the smaller dorotheas…..and they get off the water quickly due to the hot air temps. The fish usually key on the emergers and ignore anything else. Floating nymphs can also be deadly as can a wet fly technique letting the fly swing downstream in front of a rising fish…..whammo they hit it with gusto. Happens more with dorothea hatches than with many others. I have another trip on the SoHo tomorrow with Dr. Jim Kramer of Greensboro, then on Friday I will be doing a guided smallmouth trip on the Holston in Virginia with Jim as well……does it get any better? I love it. Tues……June 21, 2011…….Gorgeous morning, nice weather today early, but now hot as blazes. Guiding Mike Workman today and we had planned on doing a private water trip but the water conditions were high and muddy……or blown out. We went to the South Holston instead an are going to hit some smallmouth water on the way back. 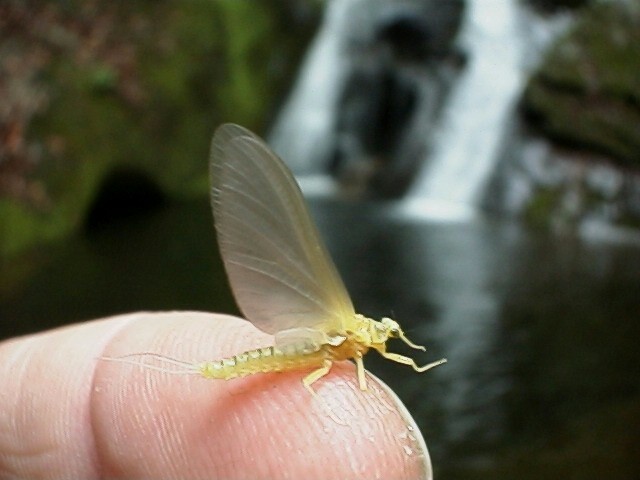 So far a good midge hatch and sulphurs later……we have put almost 3 dozen brown trout, all on dry flies, more to come…. Nice Morning on the SoHo…..
Sat…..June 18, 2011………Early start on the South Holston, we got out early to beat the heat and the crowds. Guided Wayne Johnson of Atlanta, GA, and his father in law Jimmy Jones. We didn’t have much of a hatch of any sort, but caught several nice fish on sulphurs, midges, and bwos. One new pattern , a sulphur cripple, is working well and did so today. We didn’t catch a ton, but did okay, until a thunderstorm about 145pm ran us off the water. The guys needed to be home by 600pm so we packed it in and called it a day. Friday……June 17, 2011…….After a few days of cool mornings and nice afternoons with lower humidity. Coming up is return to the opposite. But fishing has been good, we have been catching some nice browns and rainbows…..along with some nice bluegills, crappie, and largemouth and smallmouth bass. Nearly all have been caught on top……that is the best part. Thursday…June 16, 2011….Nice weather day today and had a busy day catching up on messages, emails, and some fly orders after taking the early part of the week off. Did an evening bass trip with Adam Harman and we caught some nice bass and a few other fish including crappie and bluegill. Again caught all our fish on poppers, and that was fun. 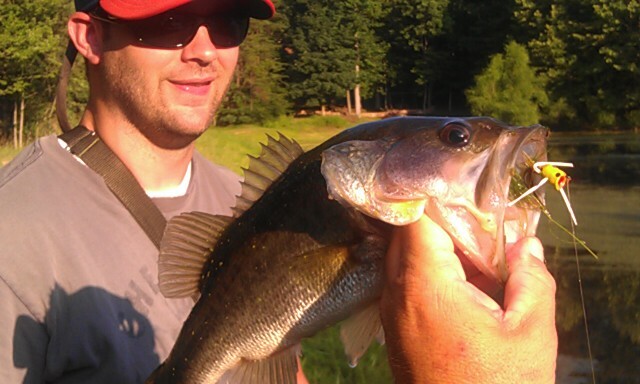 The largest bass, a 2 pounded, did an Air Jordan on us immediately after Adam set the hook. The popper of choice today, as it has been for the past two weeks for me is a size 4 Frugal Frog. The fish are liking that classic summertime retrieve…..one loud, audible plop……followed by three to four seconds of waiting for the rings to settle….then repeat. And if you do it right every now and again the bug disappears in a round swirl that can be liked to flushing a toilet…..its great fun. Will be finishing playing catch up and filling a few more fly orders, as well as gearing up for Saturday’s trip with Wayne and James Johnson of Atlanta, GA.